Over the past week, I've taken a couple of classes at our local scrapbook store, however there are little bits I need to do to complete the class projects. 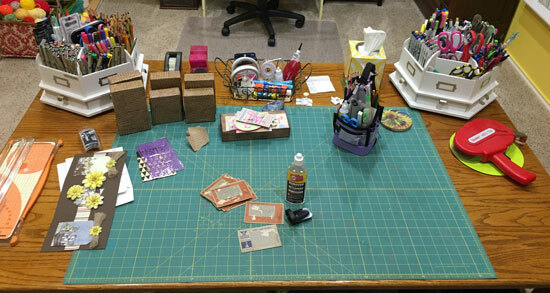 So, today my craft table has an assortment of projects waiting to be finished. On the left, that pile with the yellow flowers contains four cards, each partially completed. That long one on top is an accordion-type card. 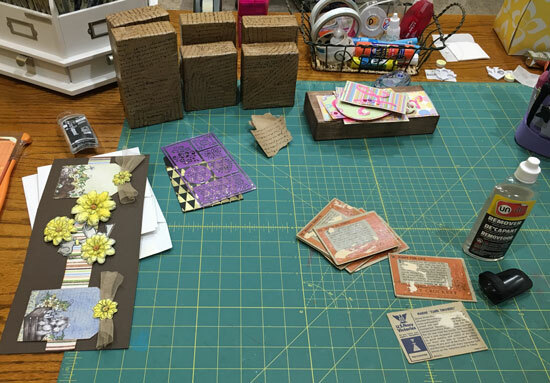 The brown blocks have all been decoupaged with stamped paper, but I want to put another coat of decoupage on them before adding the tacks that will hold the Happy Easter tags I created during another class. In the center of the table are some trading cards that Robbie picked up at a recent card show. At some point these cards were obviously adhered into an old album, and I'm slowing working on getting the remaining paper off the backs. There's also a little package of purple stencils that I want to try out in my journaling Bible. You can also see my small tool tote that I use to carry a few supplies to classes and such. There are a few extra things in there that I want to put back in my carousels before I put it away. I'm hoping to get these items cleared off by tomorrow as I have edited and ordered more photos for the custom scrapbook-for-hire project I have in progress. Remember those vision boards I was working on when my desk was all messy a couple of weeks ago? I finished those up and shared them in a blog post HERE. Joining in today with Julia at Stamping Ground for What's On Your Workdesk Wednesday. What's on your workdesk this week? Looks like some fun projects! Thanks for the visit and I hope you have a great week! What a hive of activity on your desk this week, Melissa! All very varied and interesting. Thank you for your visit and nice comment. Sounds like you've got a lot going on. I like the top card - very bright and cheery. Even with a lot of projects, your desk is well-organized. Mine, of course, is neat as a pin since I cleaned it before we left on our trip! There are always so many projects I need to finish. Good for you finishing up stuff. You are always a busy crafty lady. I see you are employing my all-time fave tool - Undu. It is a miracle worker. Did I ever share with you that I use Undu to clean the covers of used books I acquire? late start today I it is my day to visit my friend and chat for a while. it was a beautiful day with the bluebonnet dance along the highway. I may have to challenge you on the pecan pie. I bake then for my husband for special occasions. Scrapbooking is a great way to preserve memories. have a lovely week. Getting the paper off the back of those trading cards truly is a labour of love!